- Good looking case, well made and durable, fits very snugly to your tablet. - The case does an outstanding job of protecting the front and back of the iPad. - Quality material and stitching. Precise cut and design, easy acess to all ports. - The Keyboard is held to the case magnetically and can be removed or slid forwards to help prop the iPad up for typing. - The pivot function allows you to use the iPad in portrait or landscape mode. - The keyboard makes it so easy to type up e-mails and notes whenever and wherever. 1. Please fully charge the keyboard and turn it on. 2. Press 'Connect' button to open the keyboard's bluetooth. 3. Open your iPad bluetooth, find "bluetooth 3.0 keyboard" and click on it. 4. It would appear a pass-code on the iPad screen, please type pass-code on your keyboard, then press 'Enter' and it will connect. 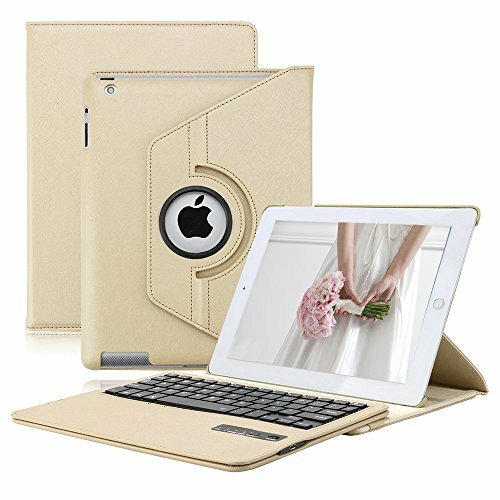 iPad Keyboard Case for iPad 2 / 3 / 4. Compatible with iPad 2nd Gen / iPad 3rd Gen / iPad 4th Gen ONLY. (iPad Model number:A1395 / A1396 / A1397 / A1416 / A1430 / A1403 / A1458 / A1459 / A1460.) You can find your iPad model number on the Back Cover. Please NOTE that the case would NOT fit any other iPad models. Stylish ,Slim and Elegant Keyboard Case. With the keyboard being detachable it allows you to use the iPad like a mini laptop or just use the case as a stand and use the keyboard separately. Support different viewing angles: It has a 360 degree rotating stand so you can rotate the iPad to stand portrait or landscape depending on what you are doing. The keyboard is easy to connect to tablet and very responsive. It makes using the iPad so much easier if you intend on typing a lot. The whole case is secured with a elastic strap. It provides good all-round protection for the iPad. Keeps tablet Safe and Secure. If you have any questions about this product by KVAGO, contact us by completing and submitting the form below. If you are looking for a specif part number, please include it with your message.